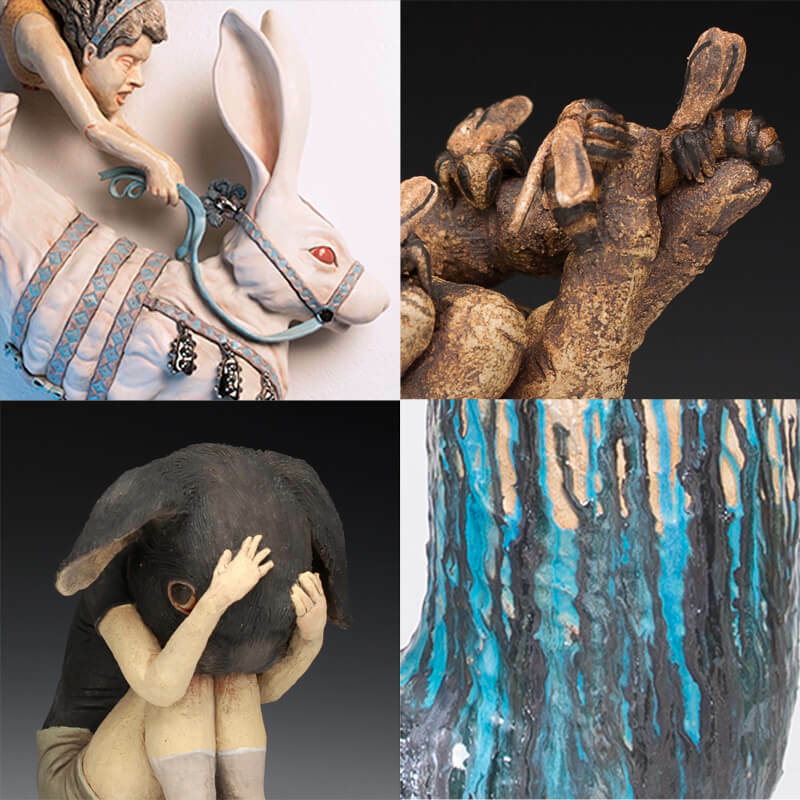 The Red Lodge Clay Center is proud to present an exhibition of our current Long-Term Resident Artists newest work. The residency program at Red Lodge Clay Center is designed to encourage the creative, intellectual and personal growth of emerging and established visual artists. Each Resident brings a unique and vital voice that adds to the richness of the Clay Center. Their work is distinct but they all challenge their materials, and push their ideas forward as they develop their professional artistic careers through our immersive, year-long residency experience. Crista Ann Ames is a sculptor working primarily in ceramics, wood, and textiles. Through the layering of mythology, iconography and personal narrative, Crista explores how our own animal nature relates to the ways we establish and sustain personal relationships. Raised on a small hobby farm in Washington State, Crista often draws on her own experiences to explore pastoral life, animal husbandry, women’s craft and fertility. Kelsey Bowen spent her childhood in the rural California foothills, growing a strong root system of inspiration in animals and nature. She is a recent graduate of the California College of the Arts Ceramics Program. She has participated in various exhibitions with her work, including the California Conference for the Advancement of Ceramic Arts in Davis, the American Museum of Ceramic Arts in Los Angeles, and her BFA solo exhibition in Oakland, California. Emily Nickel is a figure sculptor and arts educator who uses human and animal forms to interrogate societal pressures on individual identity. She holds an MFA in Ceramics from Indiana University in Bloomington. Emily’s work has been exhibited throughout the US and internationally, from Baltimore to Montana to Kyoto, Japan, and has received a number of artist’s grants and awards. She has participated in several residency programs including Watershed Center for the Ceramic Arts, Clay Arts Vegas, and Red Lodge Clay Center. Karl Schwiesow is from Homer, Alaska. He earned his BFA in Sculpture and Ceramics from Sierra Nevada Collage in 2012, and went on to earn his MFA in 2017 from the University of Montana in Missoula, Montana. Karl has exhibited works in California, Nevada, Washington, Montana, and Pennsylvania. He was a Short Term Resident at the Red Lodge Clay Center in 2015 and was most recently the Ceramic Artist in Residence at the Sonoma Community Center in Sonoma, California. Karl is currently teaching art as an adjunct faculty member at the University of Montana Western in Dillon, Montana.